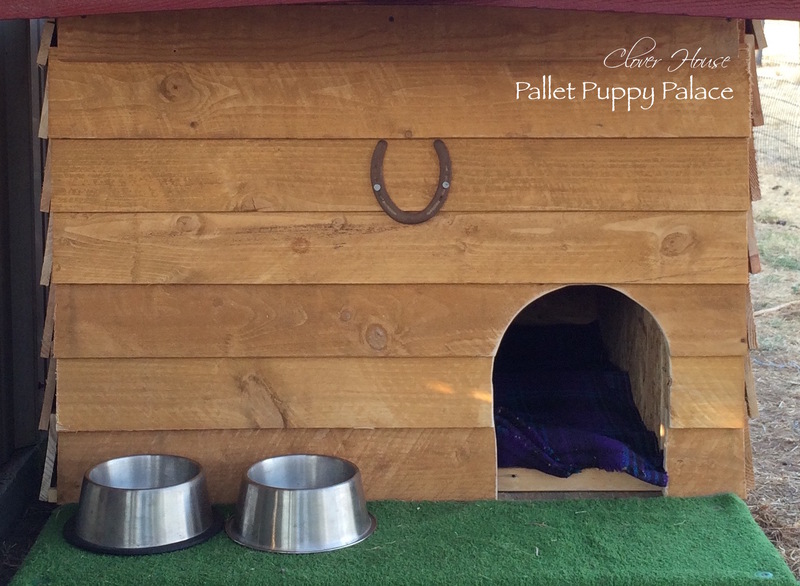 Clover House: We Made a Pallet Puppy Palace! 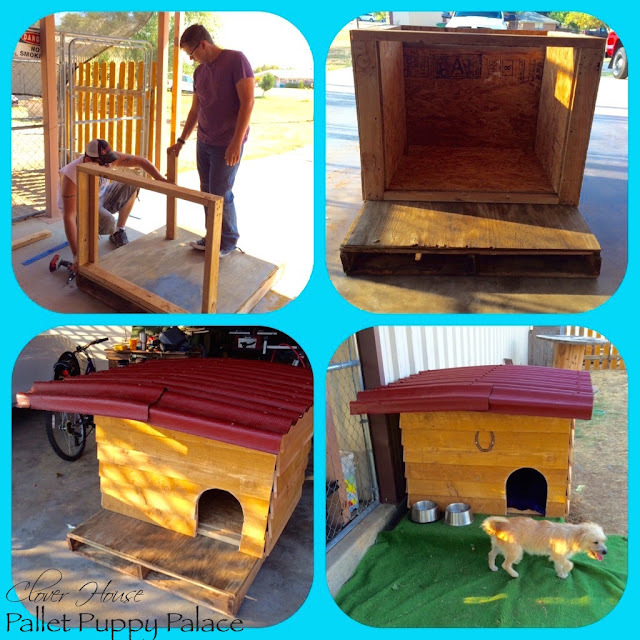 We Made a Pallet Puppy Palace! Back in the Spring we rescued two little boy puppies, Max and Leo. With Fall here and Winter on its way, they needed a proper dog house that will protect them from our cold weather that comes with Winter. 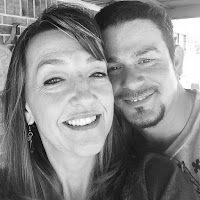 This is the house we built for them, front porch and all! THIS was our inspiration for the house we built. We had a spare pallet in the shop and decided to use it for the base of the house mostly to keep it up off the ground to be sure no water would ever get into their cozy little home. My honey built the house so that the walls could be insulated with regular house insulation (the pink panther kind), which he installed while putting the walls together. This is one warm puppy palace! We mostly used what we had on hand except for the new fence pickets and the roofing material to cover the outside and protect it from the elements. Here's a little trick we learned at the home store. We found out about this little trick while looking at what kind of siding we were going to use to cover the house with. We ended up purchasing (13) 5 1/2" x 72" cedar fence pickets instead of siding but we still used this trick to add the pickets to the house. 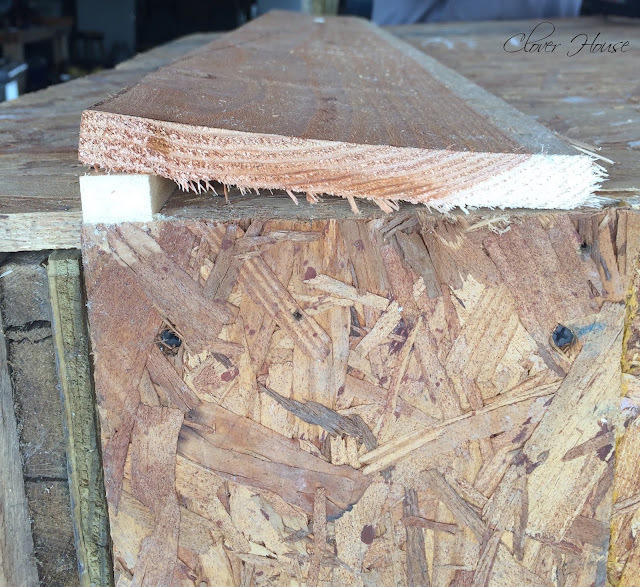 That little strip added to the bottom of the house before starting to add the pickets kept the boards laying down flat and not popping up at the top. Pretty cool huh? The roof is a Corrugated Cellulose Fiber/Asphalt Roof Panel in the shade red. We found it at Lowe's HERE. I think the puppies love their new house. They were really curious when we placed in their pen. 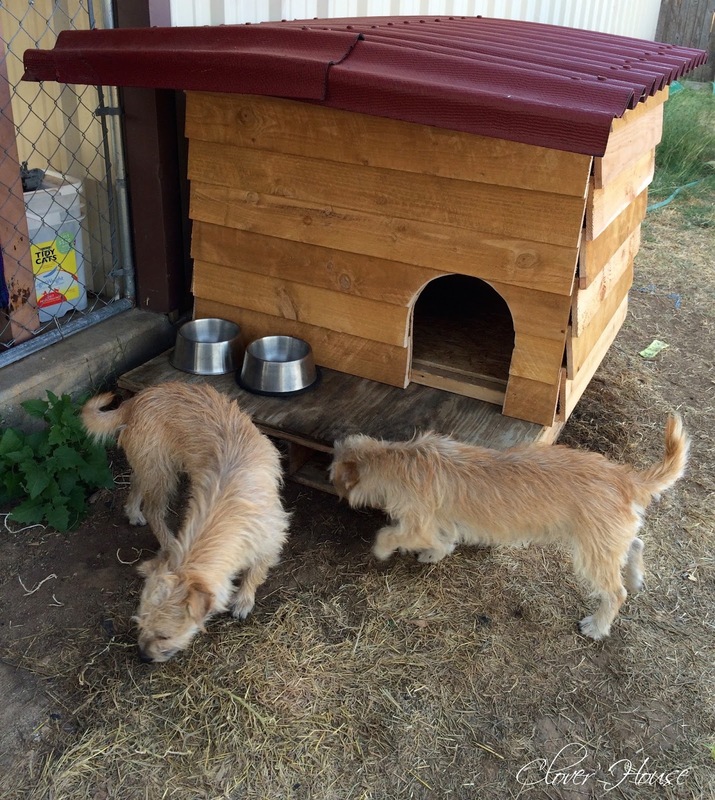 We started with a pallet and ended up with two very happy puppies! Now we don't have to worry if the puppies will be warm this Winter, because now we know they will be. I'm Linking to THESE lovely and FUN parties! And here are a few more too! Did you add any kind of insulation in the walls? I'm not sure where you live or how cold it gets hence my question. If you are in some place where it doesn't drop below say 40 degrees you wouldn't need it. I love the design, I am always on the lookout for new designs to use for feral cats. This would work well because a second doorway could be added and the roof could be on hinges to add bedding. @Lori Choman - Yes, we did insulate the walls. We drop down into the 20s sometimes here in Texas. Great idea for the dog house. My dogs would only play around it cause they prefer their comfy beds in front of the fireplace. But maybe in summer when we're all outside they may seek it out for shade.